A few weeks ago I let you all know that I was partnering with Mom Central to test drive the new Crest Pro Health Complete Rinse. Now that I've been using it for a while, I have to reiterate and say that this mouthwash is fully in line with my love for Crest products! I have to admit, after I started using Crest Pro-Health, I found that I couldn't commit to using it twice a day, which is recommended on the bottle. My problem is that the label states that you shouldn't eat or drink in the 30 minutes following the use of the product. Well, my morning routine is pretty firm in that I wake up, shower, brush my teeth, then have a cup of coffee or a big glass of water while working on this site. I need something to drink in the morning, and I only have a limited amount of time to myself to get things done before Haiden and Piper get up. Because of that, I switched to only using the rinse during my evening, before-bed oral hygiene routine. Crest Pro-Health Complete does this all without alcohol. That means there's no burning sensation after rinsing. I do love any product that multitasks! Other than the cleaning teeth and gums and freshening breath benefits, it's tough to actually measure the results of preventing cavities and rebuilding enamel, especially since I haven't been to the dentist. It does feel good, however, to at least feel like I'm doing something for my teeth by rebuilding enamel! On the downside, I didn't realize how much I appreciated the burning, spicy feel of mouthwash with alcohol when I was using it to freshen my breath. 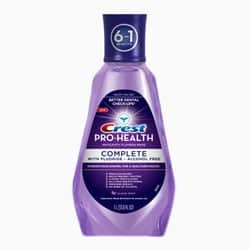 While Crest Pro-Health Complete does leave my mouth feeling clean, I think I'm still going to stick with my “regular” mouthwash when I really want to do something to “fix” my breath! All in all, I ended up thoroughly liking Crest Pro-Health Complete Rinse. I've always considered Crest and Colgate the “gold standards” in dental health, and they're the products I try to always choose for myself and my family. I'm happy to say that the new Crest Pro-Health Complete Rinse appears to me to be up to those standards! I really love this mouthwash. My hubby still loves Listerine, but I cannot stand the burn, my eyes and nose watering, and my mouth feeling like it’s going to fall to pieces. This doesn’t do any of that so I’ve made the switch. We are a “Crest” family, so I am sure we will end up trying this out. Waiting 30 minutes would also be a problem for me other than right before bed. We use Crest Pro-Health at our house but probably not as much as we should. I like that it doesn’t burn when using it like other mothwashes. Thanks for sharing.